Franklin is located just 15 miles south of Nashville in Williamson County, Tennessee. The city dates back to 1799 and has gained national recognition. Money Magazine consistently ranks Franklin Tennessee one of the Top 10 Places to Retire and Top 100 Best Places to Live. It's easy to see why Franklin was voted the Best Small Town in Tennessee. Historic, downtown Franklin is beautifully preserved and one of the features that attracts buyers to our area. 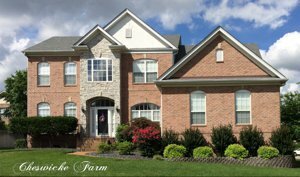 There is a large variety of Franklin TN homes for sale from one-bedroom condos to luxury equestrian estates. Franklin has the greatest concentration of million dollar homes in the entire Nashville area. Franklin real estate has the right home for every buyer. Our goal is to help you learn everything you can about Franklin homes for sale and all Franklin real estate. Use the links in the sidebar to find homes listed by neighborhoods/subdivisions, schools, property types (single-family, condos, townhomes, new construction) and price range. If you're on a phone or tablet, scroll down to find these links. In addition, you can search by address, MLS number, and zip code. Our advanced search page makes it easy to look for Franklin homes with specific criteria such as number of bedrooms, lot size and amenities. If you don't see a category that you desire, just click the envelope in the top navigation bar and let us know how you'd like us to tweak your search. We'll create a search tailored to your exact specifications. The added benefit of our website is that you have 24-hour access to all the homes for sale in the entire Middle Tennessee area. Our site is regularly updated directly from our local multiple listing service, Realtracs. That's every home listing that enters the market by every agent in the entire Nashville area. No need to register on multiple sites to get every home listing. Our website is updated before the national home search sites including Zillow, Trulia and Realtor.com. We've made it easy for you to create a search and receive daily updates of new homes, as well as, price changes on homes meeting your criteria. We've created articles about the buying and selling process in Tennessee. You won't find more comprehensive information about the Franklin housing market anywhere else. Whether you are buying a Franklin home or selling one, you'll find all you need to know about the process right here. The internet has changed the way consumers make purchases and real estate is no exception. A recent National Association of REALTORS® survey concluded that 92% of home buyers begin their search online. The majority of these buyers will start their search on sites such as Zillow, Trulia, Homes.com and Realtor.com. However, they quickly learn not all the information and listings found there are accurate. That's where we enter the picture. Buyers want local information and national websites don't provide everything a buyer needs to know about a specific area. We have responded by creating a user-friendly website geared towards buyers. While Franklin home buyers are our primary audience, we've made it easy to search for all Williamson County homes including the cities of Franklin, Arrington, Brentwood, Fairview, Spring Hill, Thompson's Station and Nolensville. As our name, Franklin Homes Realty implies, we want to be your number one source for all your Franklin real estate needs. Franklin Homes Realty LLC is not your typical real estate brokerage. Many agents in the Nashville area work 10 to 15 counties surrounding the Metro Nashville area, we work in Williamson County alone. Our services are very specialized to this area. We live in Franklin, work in Franklin, shop in Franklin, dine in Franklin and worship in Franklin. Needless to say, we know Franklin. We have visited thousands of homes in Franklin. Did you know there are almost 200 neighborhoods/subdivisions found here? Not many agents even know that. With our recent boom in real estate the number of neighborhoods grows daily. Be sure you choose an agent who is well-versed in hyper-local real estate, not one who works the entire Middle Tennessee area. The internet has changed the way buyers search for homes. They want to view a comprehensive list of the homes available in their geographic location of interest. If you want a buyer to see your house, then the old way of marketing no longer applies. Putting a sign in the yard and hosting open houses isn't the way to get your house the attention it needs. Buyers aren't driving through neighborhoods anymore. Things have changed. Buyers want instant access; not only to home listings but information about neighborhoods, shopping, dining, recreation and schools. We have responded to their requests by creating a user-friendly experience providing them with all the information they crave. We challenge you to Google your Franklin neighborhood name. We are so confident our website will rank on page one of Google that we're willing to treat you to a cup of coffee and a pastry at our favorite Franklin bakery, Merridee's Breadbasket, if it doesn't. How does this help you as a seller? It gives your home multiple opportunities to be found on our website. Your home will be listed on our featured properties page, your neighborhood page, price range page, the school page and a multitude of other unique pages we've created while blogging about your home. In addition, we'll use social media to promote your home through YouTube, Facebook, Instagram, LinkedIn and Twitter. The more exposure your home gets, the better opportunity you have for selling your home for top dollar. While Franklin is in a hot seller's market, you want your home to dominate the search engines. It's not enough for your house to appear in the multiple listing service. Finding your house is like searching for a needle in a haystack. You want proactive marketing that puts your home in front of buyers. You don't want to have to wait for them to come searching for you. New home builders have become your primary competition. You want your house to stand out from the rest. The only way to do that is hire an agent whose proven they know how to get your home in front of the right buyers online. Our dominant internet presence attracts 30,000 visitors a month to our website. That's 30,000 people who have an opportunity to view your home. Our sellers have benefited. One hundred percent of our listings have sold since 2012 for top dollar. Wondering what your Franklin TN home is worth? We've created an instant Competitive Market Analysis. No more waiting to receive an email in your inbox or waiting for a call from a real estate agent. Click the photo below and be taken to our instant property tool. We've made it easier than ever to learn what's sold in the Franklin housing market. Home sales are public information but real estate agents often think of these sales stats as proprietary. As a result, consumers turn to sources like Zillow where they don't get the entire picture. We'd rather you learn recent Franklin home sale stats from a local expert who can explain what's happening beyond the numbers. The sales price isn't the whole story. It's just one factor to be considered when selling your Franklin home. We've created recent home stats for all the neighborhoods in Franklin. Just click the envelope in the top navigation bar and we'd be happy to put you on a monthly list to receive these reports. Unlike other housing markets across the country, Franklin real estate has been in a strong seller's market for the last five years. Our unemployment rate is low and job growth remains strong. Local media has confirmed 100 people a day are moving to the Nashville area. Buyers are no longer local. Your house needs to be marketed to the many buyers moving here from other states and countries. Our website is the perfect vehicle to get your home found in the search engines. Our website was designed to provide easily accessible information about the home buying and selling process. We have created thousands of neighborhood pages to assist buyers in their home search. This site was NOT intended as a tool for other REALTORS® in our local market. And yet, many real estate agents use our website and advise their clients to use our site as well. We've created this guide to help you better understand how to use real estate websites in your home search. If you are working with a real estate agent who has directed you to our website, you may have picked the wrong agent. Why not come directly to the source? Just pick up the phone and call us today. We have created this website to encourage buyers and sellers to use our services. If you are already committed to an agent, we respectfully request you use your agent's website as you have chosen them to represent you. Every agent should have a website designed to send you new listings daily. We are in a hot seller's market. An agent website will be crucial to your home search. Don't risk missing the right house because you chose the wrong agent. The property updates you receive are not just our listings but every listing that comes on the market meeting the criteria you have established. Don't call us to show you a listing if you already have an agent. Your agent is getting paid to represent your interests, make him work for his pay. CALL FRANKLIN HOMES REALTY LLC (615) 495-0752!